If you don’t have any tattoos, it’s probably for one of two reasons. Either you don’t know what you would get, or you have fear: a fear of commitment or pain. If you’ve heard of people getting makeup tattooed on their face, again, you probably had one of two reactions: you thought they were crazy or you envied the thought of never having to experience those irritating mornings of “one eye looks better than the other.” We live in a day and age where our culture puts so much emphasis in appearance and body-modification. While tattooing the face seems extreme, someone realized that offering a semi-permanent solution to a basic aesthetics need would not only become wildly popular, but would appeal to a much larger client pool while being extremely lucrative. And how genius: what could be better than offering a service people love that goes away after a year or two, keeping them coming back for more? Microblading, a technique thought to have originated in Asia, is also known as Eyebrow Embroidery, Microstroking, or Japanese Makeup Method. The idea is that rather than implementing solid line tattoos which tend to bleed (meaning the line, which begins crisp and defined, ends up blurring), apply an ultra-fine line mimicking hair with a tool that keeps the line in its original condition. 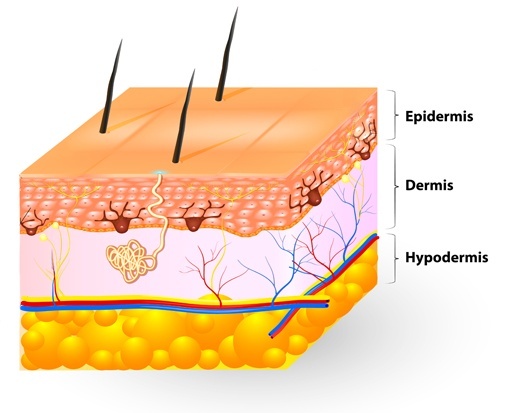 There are seven actual layers of the skin, the three main layers are the epidermis, dermis, and subcutaneous fat. While tattoos go deep into the dermis, the pigment in microblading only goes as deep as the epidermis. This not only hurts less, but is also the reason that microblading only lasts a year, for some up to three. It all depends on your type of skin. 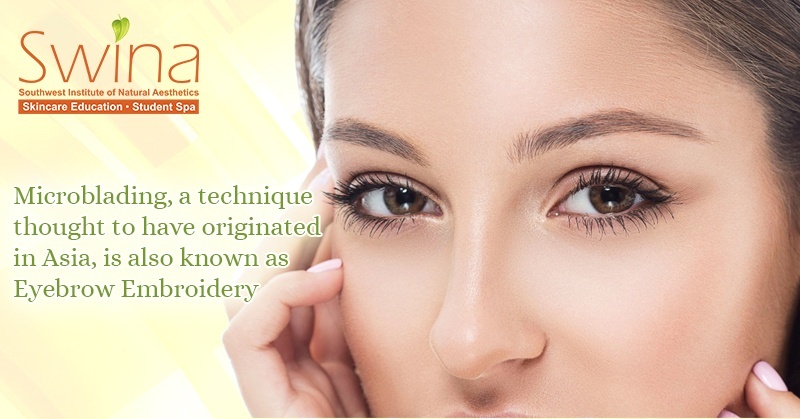 The other significant difference is that microblading, like the term suggest, uses a blade to minorly slices the skin to deposit the color, rather than puncturing. The blade is a handheld tool, comprised of 6-14 needles, and pushes the pigment into the skin. A pigment is a substance that gives something color; it can be plant or mineral based and is crucial to this art form. It is also the quality of pigment versus tattoo ink, along with the non-puncturing blading technique, that keep the lines thin rather than bleed. It is the slicing and the level at which the pigment is placed that keeps the color out of the lymph system, and in turn, keeps the lines “drawn” looking like the original, not blurred. The process is still not over. Once the eyebrows look just the way you want, it’s time to set it. This is done by turning the pigment into silicone form, which prevents it from being absorbed further into the body. The healing process differs from person to person, but generally redness and/or swelling will go away in about two weeks. Your first thought might be that this is a frivolous beauty expenditure. However, that would be judgmental, as every human spends more money on something than the person next to them, whether junk food, clothing, sports tickets, or a mortgage or car payment. There are also health reasons that would encourage a person to seek out this type of aesthetic care. Chemotherapy, a common treatment to ward off cancer cells, also leaves the patient hairless (with prolonged treatment), and not just the hair on the head. Remember, hair falling out means throughout the whole body, including eyebrows and eyelashes. What a beautiful way to offer a low-stress option of reinstating the brow, to a person who is going through the worst time in their life. Microblading is also beneficial for other ailments. For example, alopecia is a condition where people lose their hair for unknown reasons. Mental distress, as in trichotillomania, causes some people to pull their hair out. You can’t pull out a tattoo! Other issues that reduce hair include autoimmune disorders, thyroid imbalances, systemic diseases, and fungal infections of the head and scalp. This is a relatively new procedure in this country. In fact, bringing you this blog took almost fifteen different windows and web searches to get all the information. At Southwest Institute of Natural Aesthetics, we try to enlighten our community to relevant and important topics. 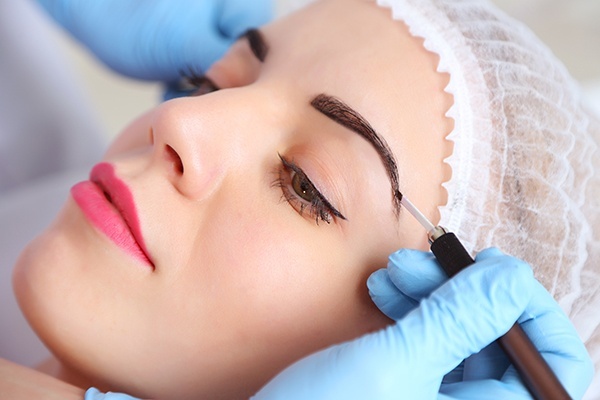 If you do not already subscribe to our blogs, please sign up: in a few weeks, we’ll be featuring one of our Great Graduates has immersed herself into her natural aesthetics career and has already begun offering microblading in the Valley! Stay tuned for the one and only Georgia Nelson!